Only days away from official launch, Testrider.com has premiered an exclusive first look at Specialized's brand new 2008 Transition. With this complete redesign of their time trial and multisport platform Specialized hopes to give their elite athletes and consumers alike a serious advantage on the road. Already getting the nod of approval from Quick Step at the Tour de France, the bike posses a number of innovative features that Testrider.com looks at very closely. As always the bike is put through its paces by site founder, and road test rider, Ben Edwards. Ridden over challenging Southern California roads, Testrider.com's goal is to determine if all of the innovation and technology actually delivers performance on the road. Take a look at the review and see the results. 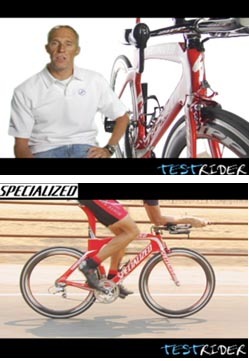 Testrider.com's review of Specialized's 2008 Transition is part of their commitment to bring the latest and most advanced products the cycling industry has to offer to cycling enthusiasts everywhere. With the sheer volume of products out on the market, and the rapidly escalating expense of performance and speed, Testrider.com wants the consumer to be informed before they buy. With their full launch Testrider.com will premier four channels, Road Reviews, Mountain Bike Reviews, Tri Reviews, and a Special Features Channel. With reviews of products from Cannondale, ZIPP, Titan Flex, Calfee, Intense, and many others Testrider will be on their way to comprehensively covering the industry. Their slogan, We ride... You Decide, will truly come into play as users will be able to rate each bike and suggest products for review. Special Features focusing on industry profiles, epic rides, and high profile athletes will make the site a destination for enthusiasts everywhere.